Kids will enjoy Safaris and Welwitschia Plains. The adventure continues: snap pictures at Swakopmund Jetty, observe the fascinating underwater world at National Marine Aquarium of Namibia, browse for treasures at Peter's Antiques, and see the interesting displays at Swakopmund Museum. To find where to stay, photos, and more tourist information, refer to the Swakopmund tour itinerary planner. Kota Kinabalu, Malaysia to Swakopmund is an approximately 29-hour flight. The time zone difference moving from Malaysia Time to Central African Time is minus 6 hours. Traveling from Kota Kinabalu in March, things will get a bit cooler in Swakopmund: highs are around 29°C and lows about 17°C. Wrap up your sightseeing on the 30th (Mon) early enough to drive to Walvis Bay. On the 31st (Tue), add some adventure to your tour with a kayaking and canoeing tour and then get outside with Outdoor Activities. Get ready for a full day of sightseeing on the 1st (Wed): stroll through Long Beach Leisure Park, stroll through Dune 7, and then take in the waterfront at Walvis Bay Waterfront. For traveler tips, maps, where to stay, and other tourist information, read Walvis Bay online travel route planner . You can drive from Swakopmund to Walvis Bay in 2.5 hours. Alternatively, you can do a combination of car and train. In March in Walvis Bay, expect temperatures between 29°C during the day and 17°C at night. Cap off your sightseeing on the 1st (Wed) early enough to travel to Windhoek. Kids will enjoy Safaris and NamibRand Nature Reserve. There's still lots to do: head outdoors with Deadvlei, hunt for treasures at Namibia Craft Centre, see the interesting displays at National Museum of Namibia, and look for gifts at Herrle & Herma Jewellers. For other places to visit, ratings, and other tourist information, read Windhoek day trip planning website . Getting from Walvis Bay to Windhoek by flight takes about an hour. Other options: do a combination of flight and car; or drive. In April, plan for daily highs up to 31°C, and evening lows to 15°C. Finish your sightseeing early on the 4th (Sat) so you can travel to Chobe National Park. Kick off your visit on the 5th (Sun): stroll through Savute Reserve. On the 6th (Mon), you'll have a packed day of sightseeing: stroll through Serondela Reserve and then stroll through Nogatsaa and Tchinga. Plan a trip to Chobe National Park easily and quickly by telling Inspirock to suggest an itinerary. You can fly from Windhoek to Chobe National Park in 4.5 hours. Finish your sightseeing early on the 6th (Mon) so you can travel to Ngamiland East. 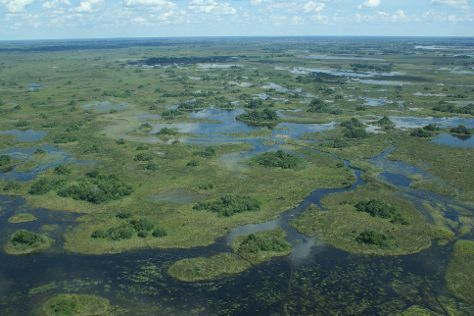 On the 7th (Tue), tour the pleasant surroundings at Okavango Delta. Get ready for a full day of sightseeing on the 8th (Wed): tour the pleasant surroundings at Moremi Wildlife Reserve. For where to stay, photos, reviews, and tourist information, read our Ngamiland East trip planner . Use the Route module to find suitable travel options from Chobe National Park to Ngamiland East. In April, daytime highs in Ngamiland East are 34°C, while nighttime lows are 19°C. You'll set off for home on the 9th (Thu).